​The rhinoceros auklet is named for the white plate that sticks up from the base of its heavy orange bill in a horn-like fashion when in breeding plumage. It also has two thin white plumes on each side of its face when in breeding plumage; these plumes somewhat resemble a long moustache and long white eyebrows. In winter plumage the horn is absent and the facial plumes are reduced. This large, stocky seabird is blackish brown above and paler on its sides, belly, neck, and throat. Immature birds have a reduced horn, little to no facial plumes, darker eyes, and a smaller dusky yellow bill. This seabird can be found both close to shore and far from land. It commonly feeds closer to shore, particularly in areas where currents cause food to concentrate. In winter flocks may be found in coastal bays at night. This species nests in burrows in the ground with some vegetative cover above, on islands from the Aleutian Islands to southern California. While it is more migratory than most other western auk species, its summer and breeding ranges overlap greatly so it is found year-round from northern Vancouver Island to southern California. Its winter range extends further south along part of Baja California. 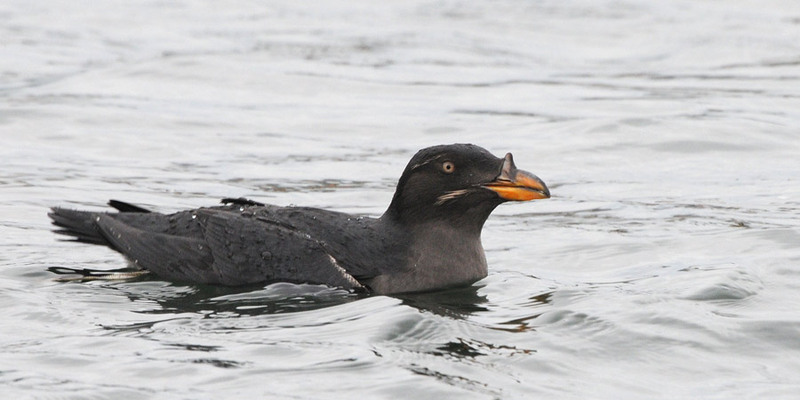 The rhinoceros auklet's immature plumage could be confused with the smaller Cassin's auklet (Ptychoramphus aleuticus). The former has a heaver bill, while the latter has a small white crescent above each eye and a light spot at the base of the bottom half of the bill. The rhinoceros auklet lays a single egg. Both parents incubate the egg and tend to the young when hatched. 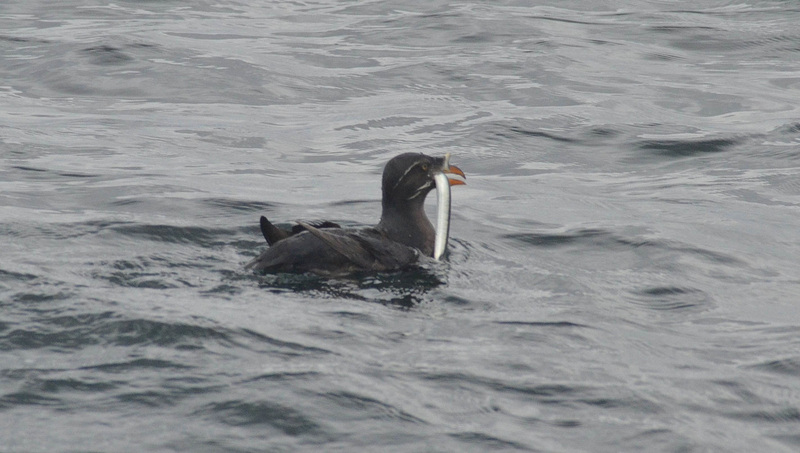 Rhinoceros Auklet. The Birds of North America Online (A. Poole, Ed.). Ithaca: Cornell Lab of Ornithology; Retrieved from the Birds of North America Online. Accessed 20/06/2016. 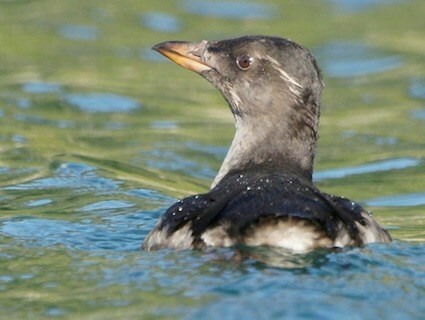 Rhinoceros Auklet Cerorhinca monocerata. Audubon Birds. National Audubon Society. Accessed 20/06/2016. Dunn, J. L. and Alderfer, J. (Eds.). (2011). National Geographic Field Guide to the Birds of North America. (6th Ed.). Washington, D.C.: National Geographic Society. Pp. 262-263.